We're getting hammered right now, it's dropped 3" in the last 45 minutes. Up to about 9" now, wind is 30 MPH and roads are completely fucked. I'm so glad I have something with 4 wheel drive, this is the craziest snowstorm I've seen since the mid-90's. Sounds like your transfer case is falling apart. Then what in the hell are you talking about lol, it's automatic AWD with slip detection with the ability to lock in full time. I don't have a Hi/Lo. I was expecting to hear grinding or clicks from slipping or something, it's working as it should. I was just trollin' you. I don't even know what kind of car it is. Classy. What happened to the Colorado or Canyon? Forgot which one. lmao, goddamn. I remember talking to you about you wanting to get an SUV or something a while back, but now I can't remember what it was. I have three vehicles myself and I find myself only really driving one. That’s my mom’s car on the left. We’re trying to dig her out. There’s an SUV that someone just ditched a bit up the road you can see. Someone came down earlier and smashed into my mom’s car and drove off. Hit and run. I’m on the left. 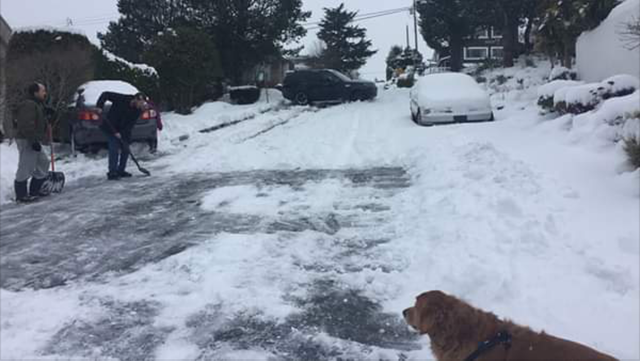 My friend is to the right of me shovelling. My dog is on the bottom right. We got like 13” and more is coming down as I post this. I assume you live in BC? I live in White Rock, BC. It’s a city on a hill on the coast, looking South for the sun. Lots of steep hills which are treacherous. That looks absolutely terrifying to drive on in those conditions. We getting over 15" tomorrow. Which means that I'll work from home in my underwear smoking weed.